We don’t need to dig up your flooring or garden in order to locate your leak, our leak detection specialists use the most accurate leak detection technology to pinpoint the source of your leak to within 50Mm of the leak location. Because we use non invasive leak detection methods our services workout to be extremely cost effective, this is because hours of labour are saved in the leak detection process. Invasive methods of leak detection require the lifting of flooring, digging of the ground along the path that the leaking pipe is thought to run. This is obviously a time consuming and therefore costly process. In addition to this you are normally required to hire a plumber to repair the actual leak once it has been located. 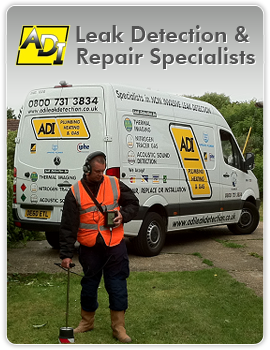 At ADI Leak Detection we precisely locate and repair the leak, Save time and money by using our services. Labour to repair the leak once it has been located is included in the price, unless extensive works are required. In this case we would assess and advise on an appropriate course of action. As we precisely locate and repair your leak in one visit, this causes less disruption to your daily life. No more waiting for the leak detection company and then waiting for the plumber! We do it all! All staff carry a good van stock to repair the majority of leaks quickly and efficiently. My pledge to you as a customer is to provide you with the best quality leak detection and repair service and to make your experience with us one that you will want to tell your friends all about. Have You Got A Leak Detection Emergency? Can ADI Deal With Swimming Pool Leaks? ADI use only NON - INVASIVE Leak Detection Technology To Precisely Pinpoint Your Leak. ADI are extremley proud of the service we offer. Read our testimonials here.